Millions of pets suffer from pain but with the right approach, it is possible for your pet to live a comfortable, happy life. Whatever the cause behind joint issues, we have a solution to help in a variety of forms that make daily doses easy and, most of all, painless. NSAIDs are the drugs of choice to relieve pain associated with osteoarthritis but not all NSAIDs are created equal. 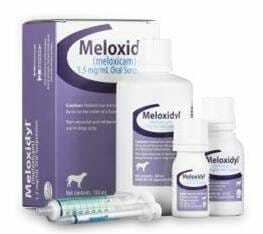 Meloxidyl®* helps dogs get back to enjoying life, at a price that’s easier on you. Meloxidyl is indicated for the control of pain and inflammation associated with osteoarthritis in dogs.. Knowing more about the signs of osteoarthritis is a key first step in helping to improve your dog’s quality of life. *As a class, NSAIDs may be associated with gastrointestinal, kidney or liver side effects. These are usually mild but may be serious. The most common side effects seen in studies are vomiting, soft stools and diarrhea. If side effects occur, pet owners should discontinue use and contact their veterinarian. As with any NSAID, all dogs should undergo a thorough history and physical examination before the initiation of NSAID therapy. Appropriate laboratory testing is recommended prior to and periodically during administration. Concurrent use with other anti-inflammatory drugs, such as NSAIDs or corticosteroids, should be avoided. The safe use of Meloxidyl® OralSuspension in dogs younger than 6 months of age, dogs used for breeding, or in pregnant or lactating dogs has not been evaluated. Do not use Meloxidyl Oral Suspension in cats. Acute renal failure and death have been associated with the use of meloxicam in cats. See package insert for full prescribing information.